Unframed stretched canvas. Image of sunflower in pot on table, ears of corn laying to the left. This painting appears to be an unfinished work done in the last few months that Hisako Hibi and her family were at Topaz concentration camp. The colors are rather muddied and it seems as though Hibi painted this image over another one. 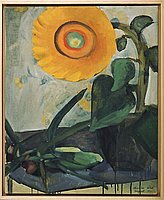 The image of another painted sunflower is visible beneath the top layer of paint. Rings of color are used to depict the sunflower that dominates the canvas. There is little modeling or detail in this work. Drips of paint are also evident in this work, suggesting the unfinished nature of the painting. In the inscription on the back Hibi notes her admiration for the sunflower that thrived in the desert climate.